Caltech’s Hirosi Ooguri advances the mathematics of string theory to solve riddles of black holes and basic matter. Born in Japan, Ooguri received a B.A. in 1984 and M.S. in 1986 from Kyoto University, and became an Assistant Professor with tenure at the University of Tokyo in 1986. He was a research associate at the Institute for Advanced Study in Princeton from 1988 to 1989. He received Sc.D. from the University of Tokyo in 1989. Subsequently he has held teaching and research positions at the University of Chicago, Kyoto University, University of California at Berkeley, Lawrence Berkeley National Laboratory, and, since 2000, the California Institute of Technology. The Leonard Eisenbud Prize for Mathematics and Physics and Humboldt Research Award are among many academic highlights, and in 2008, he delivered the Takagi Lectures - the only named lecture series of the Mathematical Society of Japan. He has held visiting appointments at Harvard University and at the University of Paris, and was a 21st Century Center of Excellence Visiting Professor at the University of Tokyo in 2007. Ooguri is a member of the Aspen Center for Physics and is on the advisory board of the International Solvay Institute in Brussels and the Banff International Science Station. Theoretical physics has a beauty particularly appreciated by those highly adept in mathematics. One of those who does grasp the beauty and wonder of the quantum world -- and seeks to explain it to the rest of us -- is Hirosi Ooguri, the Fred Kavli Professor of Theoretical Physics at the California Institute of Technology. For him, that excitement springs in part from the sheer magnitude of things. Like other physicists seeking a common ground between the theory of the very large (general relativity), and the very small (quantum mechanics), Ooguri has every speck of the universe in his mind’s eye. “If you look at nature, there are two endpoints on the length scale,” he says, and they are unimaginably far apart. They range from the Planck length, the smallest meaningful measure of distance (1020 of these make up the diameter of a proton), to the size of the visible universe, about 5.4 x 1061 Planck lengths. That’s 54 followed by 60 zeroes. Ooguri seems even more amazed by the power of science to comprehend matter over such a vast range. He sees a single theory emerging that he hopes will explain the behavior of nature at both points of the length scale equally well. This is string theory, a framework for understanding the qualities of elementary particles such as quarks and electrons. (The “strings” are posited one-dimensional lines that oscillate in distinct patterns that define the different particles). Ooguri has been thinking about the fundamental laws of nature for a long time – since before his university days. And his thought has a strong mathematical bent. “Even though he’s a theoretical physicist, his work is breaking new ground in mathematics,” says John Schwarz, a fellow physicist at Caltech and string theory pioneer, who has called Ooguri one of the leading theoretical physicists in the world. Ooguri “has contributed to many different aspects” of string theory, adds Schwarz, who points in particular to Ooguri’s work on the development of topological string theory. This is a new toolkit in geometry that helps link the challenging math of string theory – played out in six higher dimensions – to what can be seen in the four observable dimensions of space and time. Schwarz describes it as “some kind of approximation to the real string theory that we think will describe what we will see in nature.” To put it another way, Ooguri is helping to boil down the daunting 10-dimensional complexity of string theory to something that the human brain – at least a theoretical physicist’s brain – can get around. Ooguri has used topological string theory most notably to untangle the riddles of black holes. Black holes play a key role in theoretical physics because they present an extreme environment where matter and energy do not behave in their usual ways. Formed by the collapse of large stars, they compress so much mass into such a small area that their gravitational field does not allow light to escape past a boundary known as the “event horizon.” What happens behind that horizon is unobservable. No information leaves a black hole. Not only that, but the laws of general relativity suggest that information entering a black hole simply ceases to exist, with different physical states converted into the same black-hole state characterized only by its mass and angular momentum. Yet physicists Stephen Hawking and Jacob Bekenstein showed in the 1970s that black holes act like other objects governed by the laws of thermodynamics. That is, they should have heat along with entropy, which increases randomness as temperature rises. But with all physical information eliminated it – that is, with everything reduced to a single state – a black hole should not be able to produce so many possible different states. 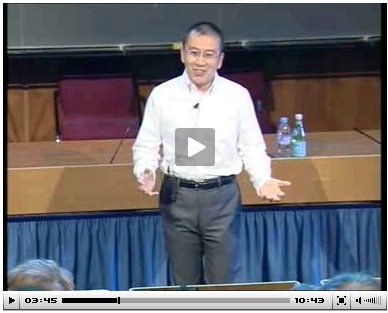 Hirosi Ooguri gives a review lecture about String Theory at Strings 2008 conference held at CERN. This so-called “black hole information paradox,” if true, means something has to go – either general relativity or the rule of causality. Either information survives in the black hole, in apparent defiance of general relativity, or nature is violating a basic principle of science – the rule, as Ooguri explains, “if you know an initial condition and the laws of nature, you can deduce what will happen or what happened in the past.” If you believe in causality, then the entropy of a black hole has to have been caused by some information that somehow survived its passage through the event horizon. But how? Ooguri and others have sought to solve the riddle by proposing that the chain of causation behind black hole radiation and entropy can be located at a level of matter even more basic than the elementary particles. In other words, they have turned to string theory. It’s like the burning of a book, Ooguri says. “When you have a book and burn it, apparently you lose information. But if you keep track of everything, you find that it contains the information of the book in a very subtle way.” By retracing the paths of each molecule of paper and ink that went through the blaze, one could conceivably reconstruct the pages. In a similar way, physicists might be able to explain how information is conserved in a black hole by retracing the activity of every particle just outside the event horizon. But this is hugely more complex than piecing a burned book back together. Understanding how the information is encoded requires the ability to think in at least 10 dimensions -- the four that we perceive, plus the six dimensions believed by string theorists to be curled up tightly to create the elaborate structures of elementary particles. To a physicist, “beautiful” only gets you halfway there. No matter how elegant a theory may be in the mathematical realm, the physical sciences cannot be satisfied until it is somehow verified through observation or experiment. This is a tall order with string theory, which is played out in realm too small to be observed with existing instruments. Ooguri says the Large Hadron Collider, now being readied for operation in Switzerland, has enough energy to probe dimensions measured in billionths of billionths of a meter. But even that is not small enough to observe matter at the scale where some version of string theory can be shown to resolve the contradictions if the two cardinal theories of physics, general relativity and quantum mechanics.